There are two Bianco43’s in Greenwich. 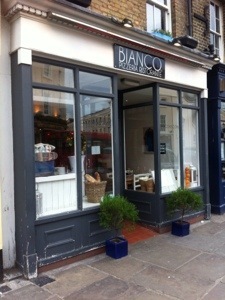 This has been confusing me since an Italian friend suggested meeting there (before deciding she was actually gluten intolerant) and I was intrigued as to how we could fit in at the takeaway only Bianco 43 that I knew of in Lassel Street. 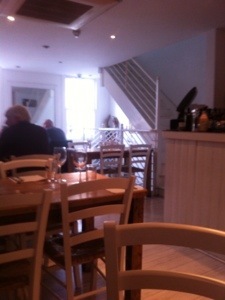 This was actually a bit daft of me, because Bianco 43 the restaurant is kind of hard to miss on Greenwich Church Street near the Cutty Sark (number 43 in keeping with Napoli traditions of restaurant naming). We sailed in on a Monday evening, expecting dead quiet, and were genuinely impressed to find it pretty full at such an antisocial time. The beachcomber interior of white walls and pale wood was glowing in the sunny evening and we sat upstairs to analyse the menu. 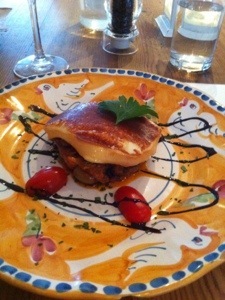 I went for fried smoked cheese with sweet and sour aubergine (scamorza alla piastra con caponata siciliana in agrodolce- I did not order it in Italian.) which was delicious, two smokey flavours together. But I should have thought ahead. 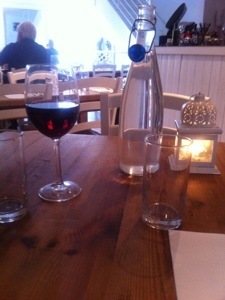 Pizza’s were split by pomodoro (tomato sauce based) and bianche (not tomato sauce based). 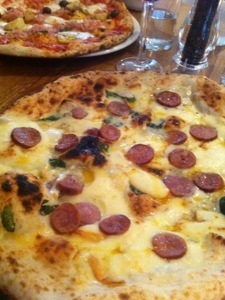 Pizza is always tomato based, I thought- I will have bianche. Foolish. This meant even more cheese, albeit with small studs of basil embedded in it. Both pizzas came in authentically rough ovals, oozing with giant pizza bubbles. I bet you won’t find bubbles like that in vision express*. I wish there had been more green stuff. More something not cheese. I struggled. I swapped a slice with my husband. His capricciosa was full of deep flavours. 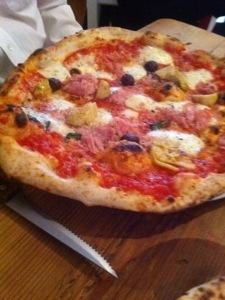 It was loaded with convincing mole hills of ham offset with artichoke and olive, real olives with real stones. I tasted my husband’s valpolicella (which went way better with my pizza than his because it cut through the oil, but did he offer to drive? Did he?) but after cheese for starter too… there was no way that so much cheese could be finished in one night. A distraught waitress ran over to check if everything was ok, and seemed only too pleased to respond with an offer of boxes to take away. I can’t decide if we started a trend here, or whether it was a sign of belt-tightening times, but many boxes followed ours. (It was great cold the next day, by the way). The other dish on the table was superior calamari. 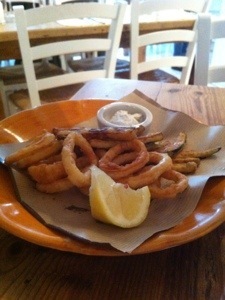 Only recently have I realised that not all calamari is made equal, which is strange for something apparently so simple. This dish was unusual in not being remotely rubbery and avoided a flaw i have recently begun to notice of calamari being overly deep fried. It came with a side of deep fried courgette. I am less keen on this addition. I can also vouch that it was not rubbery… But it would be kind of strange if courgette were rubbery. It was a bit embarrassing to ask for the dessert menu after the box incident, but hey it was dessert, we got over it. The waitress didn’t bat an eyelid. Although we were given two knives and one spoon for the 2 desserts, no doubt to make us feel less embarrassed by our faux pas. The inability to picture some of the desserts held us back. Could chocolate cream cake outweigh my previous chocolate cake disappointments? Was the tiramisu the way I like it? We chose well, readers. Very very well. 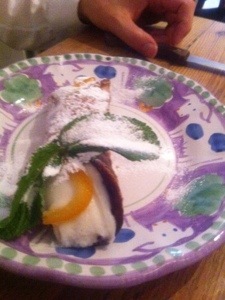 The owner flashed a smug smile at the choice of cannolo, sweet ricotta in deep fried pastry with a grainy texture and crunch to the pastry, and fruit filled sorbert (sic) – which turned out to be fruit with sorbet in and not a wounded Albert with lots of fruit inside. 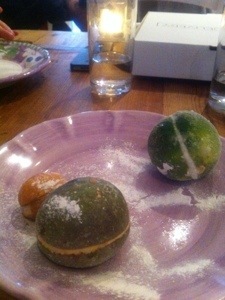 FFS was lemon sorbet- proper tart, mango sorbet in lime – mmm and spectacular walnut sorbet in a walnut shell. Shipped in from Naples, so the owner told us. Coffee? I’m starting to feel the pressure. How many times can I describe really good coffee? It was really good coffee. Smooth, flavoursome. Bianco 43 covered the cost of this meal. I am sure I saw a skip in my husband’s step as we left. * yes. I know. It was deliberate.